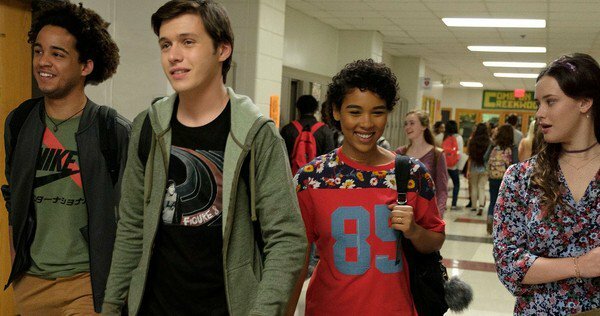 Love, Simon is an upcoming movie based on the book. That book was called Simon vs. The Homo Sapien Agenda. I don’t know anything about this film going into it, but I wish, wish, wish, it had the same title as the book. That is such an exciting title! And one that would probably turn off a lot of potential viewers. Heck, it makes me think of Scott Pilgrim vs The World. Who doesn’t want to be associated with that masterpiece? Oh well. Sometimes you have to make the money decision instead of the fun, original, cool decision. Best friends until the very end, no secrets between them, none whatsoever. Simon (Nick Robinson) is your typical high school teenage senior. He has regular parents (Jennifer Garner, Josh Duhamel), who might be a bit rich sure, and a younger sister (Talitha Eliana Bateman) who wants to be a chef. He has some BFFs for most of his life in Leah (Katherine Langford) and Nick (Jorge Lendeborg Jr.), including a new girl to their group Abby (Alexandra Shipp). Oh, an he is gay too. Totally loves the dudes. Just hasn’t told anyone despite knowing it for years. But then something changes. Their school/community have their own little Post Secret group that still is in use, where people can post rumors, or comments about their lives. And it turns out that someone else in their school is gay. Well, secretly gay. So Simon decides to email him and set up a correspondence with this Blue fellow to share their feelings. In secret of course. This email turns into a bit of a fascination for Simon. He longs to hear back from his secret friend, and even finds himself falling in love with his words. Unfortunately, the longer he obsesses over his email, the more likely he is to screw up with these emails and accidentally let his secret out. Also starring Logan Miller, Keiynan Lonsdale, Miles Heizer, and Tony Hale. What a diverse group of totally normal friends! If I had to describe Love, Simon in the least amount of words, I would just tell you “Never Been Kissed, but gay.” For those of you familiar with that movie it should be pretty obvious. A person in school has a secret, the secret is found out, and it ends with romance! A lot of movies have similar plots, but this one really drives home these aspects. And after saying all of that, that is not a negative on Love, Simon. I loved Love, Simon. It was cute, it felt real, it was modern and topical. Robinson as a lead had a constant look on his face to show he was hurting on the inside, unsure of how to express his feelings that are giving him so much angst. The pressure builds on him throughout the movie, once his secret starts spreading without his knowledge and consent. And finally, by the end, the acceptance of his fate, his character has different body movements and an aura about him. It is a wonderful change to process. I hated the people that were dicks, I loved his circle of friends, and the consequences of his lies and actions went completely believable ways. This is just a nice feel good romance teenage coming of age story. I cried several times, from both being upset and sad, to happiness. It was good amount of feels. An appropriate, non groping amount of feels. And unsurprisingly, this feels like a film I could easily watch again and again for years to come.